After my recent embroidery course, I wanted to get busy and practice some of the new stitches I'd learned before they were forgotten. 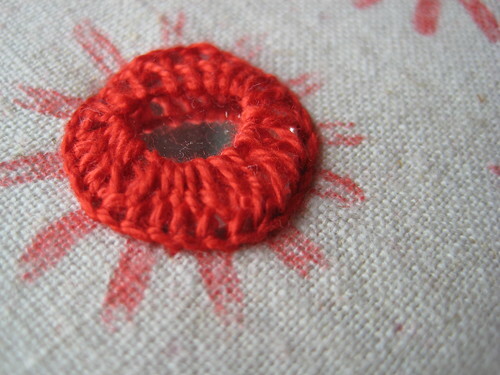 Suzanne requested a hoop featuring some of my poppy-printed fabric for our private swap. It's not complete yet, but here is where things stand at the moment. I picked up this oval hoop at a charity shop last spring and have been wanting to use it for a swap. 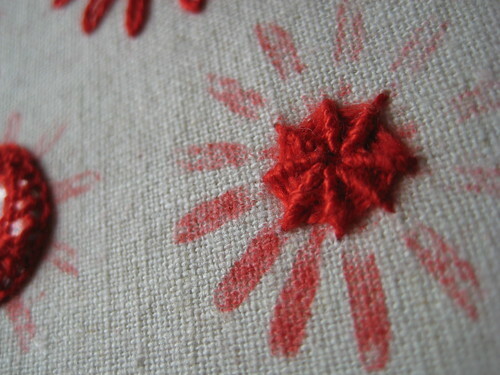 The fabric is a natural linen printed with red ink and I used Presencia perle 8 cotton for the embroidery. My idea was to embellish the prints, using their symmetry to guide my stitching, without entirely concealing the printed forms. Check it out: I learned how to do Shisha! It's more fun saying Shisha! than it is stitching those little mirrors on, trust me. I need more practice to get my stitched frame more symmetrical (obviously). Please don't ask for a tutorial, because this is a technique you've got to see done right in front of you. Possibly 10 times over before you will 'get it'. Ahem. I may need a trip to India. Next is an old stitch with a new look. How adorable are these sets of three nested lazy daisies? Something else I learned is the wrapped spider web. Perfect for the season! I'll be mailing the hoop inside this embroidery project pouch that I made before our summer holidays. 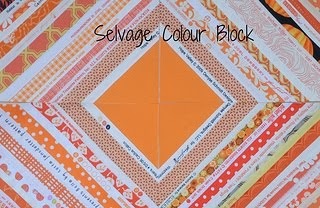 Made with 'twofers' leftover from this project's flying geese blocks. 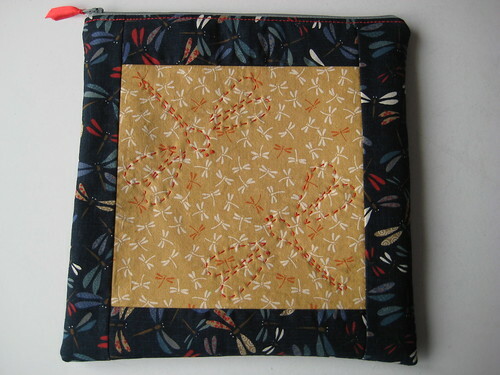 Here's the flipside, with some stitched dragonflies. My to-do list is dwindling now that I am almost done with swap commitments. 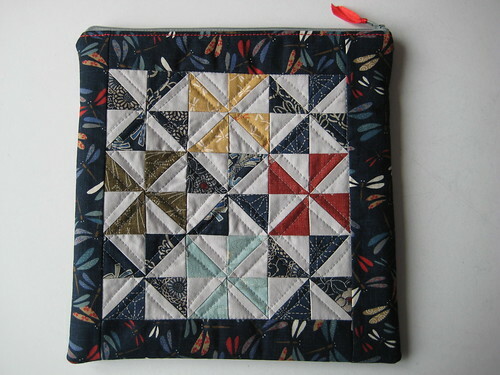 I'm not taking on any new ones so I can free up some creative time for Christmas gifts and a bed quilt for us that I want to have pieced before the holidays. Here's to a productive week ahead! oh, i love the embroidery! that is one crafting skill that i lack in. would love to learn someday! Doh! 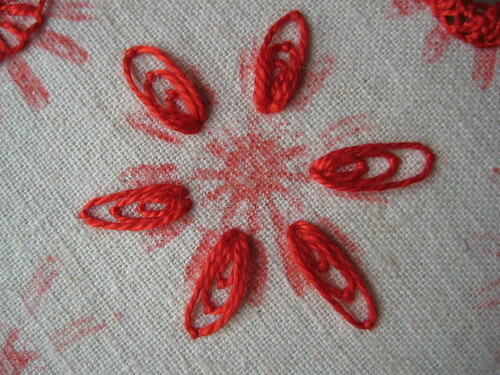 I just 'nested some daisies' while teaching myself embroidery. I hadn't seen that before.. just thought it up. lol Apparently not new. Is that what it's called? I put them into Dragonfly wings in the last Saturday Stitches post. So sweet! Wow! Your embroidery is gorgeous. I'd love to learn how to do shisha. Beautiful! I used to embroider, I wonder what happened? 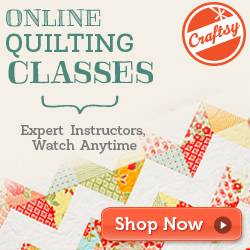 Too busy quilting, I guess! Ya, I should probably take an embroidery course. I like it a lot and know like two or three stitches which I use over and over again. There are little mirrors in there? SO cool! The whole sampler looks awesome. And your pouch? Well... let's just say I'm super-fond of pinwheels and thus, super-fond of that pouch of yours. Just gorgeous! Your embroidery work is amazing!!! And love your bags!! The fabric is VERY sweet...looks familiar! !Love it! The embroidery is absolutely beautiful! Oh, I love the embroidery. Very inspiring. Wow, those embroidery stitches are fabulous and so sweet on your printed fabric! oh thats lovely. i love all your stitches.you are very clever. I'm in awe of your embroidery skills! You are my stitching hero. No really. Amazing, I just love it. What a great project! I love the poppy print fabric with the embroidery on top. What dimension and what a treat to receive. I am going to pick up some linen-type fabric this week for a special October embroidery project! Everything looks lovely - I am sure the recipient of your gift will cherish it !! 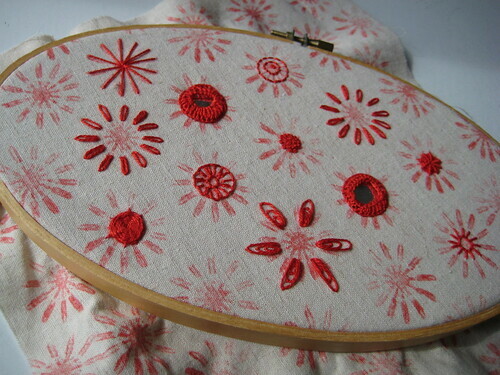 Beautiful, beautiful embroidery stitching, Krista! I don't even want to begin to ask how you did the stitching with the mirror inside! It's so pretty to look at but terrifying to think about trying on my own! Are you making customized Christmas cards again? 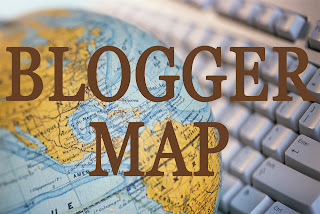 I am excited to see your Christmas projects! 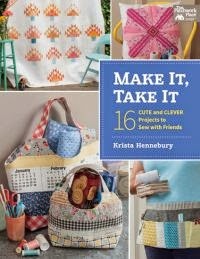 gorgeous sampler! and i love love love my oval hoop. it's the perfect size for my hands. Fantastic Krista! I love the colors!! Oh wow. This is fantabulous! I'm just getting back online after being gone for a long weekend and I'm tickled pink (or should I say red?) by this hoop. I'm amazed by your new stitching techniques!